A.P. Coleman uncovered Toronto's prehistory, among other adventures. 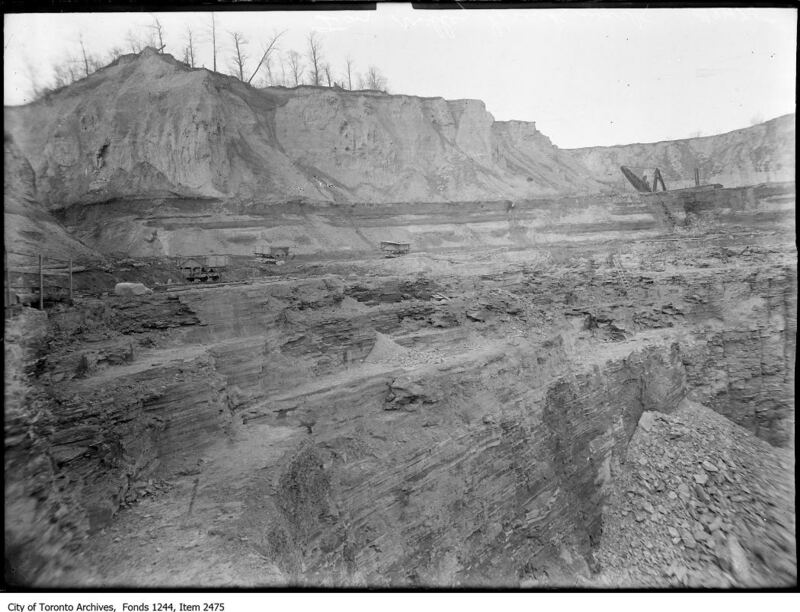 Excavation at the Brick Works in the Don Valley c. 1908. Photo from the City of Toronto Archives Fonds 1244, Item 2475. If you’re at the Evergreen Brick Works Market in the Don Valley, walk north along some 200 yards of lovingly created wetland. When you’ve gone about 50 yards past that, you will be on a little rise. Look behind over your shoulder for a view of the downtown skyline. Then keep on walking until you get to a little cul-de-sac and look at the cliff face that you have been staring ahead at for the last while. It is overgrown. The small plaque in front of you states that you are facing one of the oldest geological formations in the Toronto region and that it was first “discovered” (let’s be more precise and call it “labelled”) in the 1890s by geologist A.P. Coleman (April 4, 1852–February 26, 1939), a scientist and public intellectual of great renown in his day and a figure still dimly remembered now. Coleman’s work on the traces of the last great ice age (the Pleistocene) enable us to view the Brick Works park within the broad perspective of the long history of our city. Detail from a 1932 Ontario Department of Mines Annual Report map (41G) by A.P. Coleman. 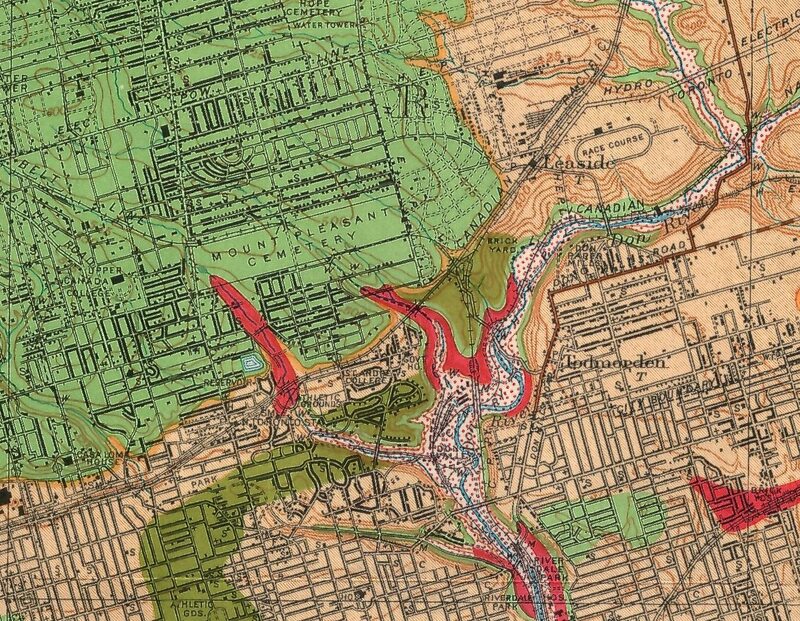 Image courtesy of the University of Toronto map library. That cliff before you is probably the oldest face you will ever meet in Toronto. That downtown view you just enjoyed is one of the newer faces in the crowd. Can you—as if stumbling across an old acquaintance whom you haven’t seen in decades—fit those two views together into the same person? Coleman sought to bring home to his readers the utter familiarity of a locality that seems almost as old as time itself, yet one that we know intimately in another, more urban, guise. The fact is, Coleman stands as a thoroughly modern figure of our history who nonetheless illuminated our distant prehistoric past. Considered today, his work gives us a perspective on ourselves and our surroundings that is inescapable during our Anthropocene era of climate change. We just got here, and we may well not be around that much longer. Coleman had a prodigious interest in the world around him, which led him to academic pre-eminence, world travel, mountain climbing, extensive public lecturing, painting, canoeing, and literally ground-breaking work essential to the development of Ontario’s modern mining industries. 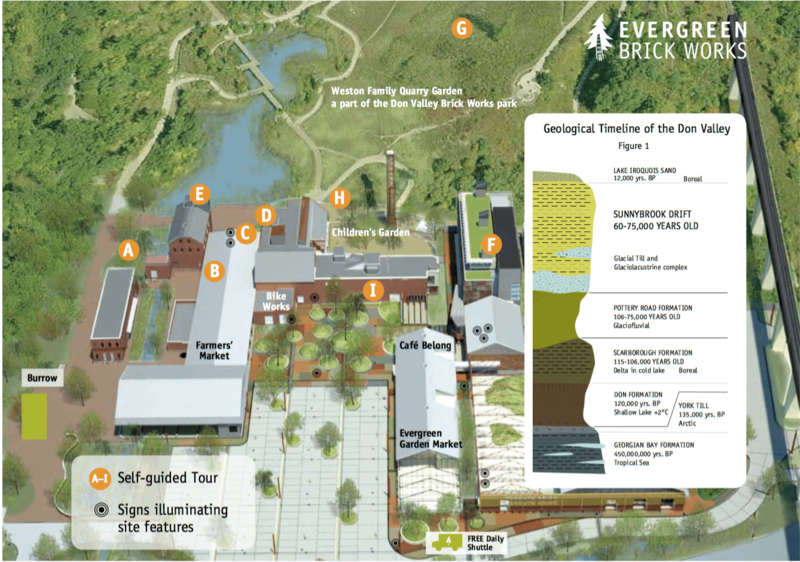 A tour map of the Evergreen Brick Works showing the geological age of the site. Image used courtesy of Evergreen Brick Works. Back to the cliff face in the Don Valley. When Coleman in his pursuit of geological knowledge of the town he lived in first looked at it, it was a great deal more overgrown than even now. It had to be cleared, and an 1895 article of Coleman’s in the Journal of Geology speaks matter-of-factly about the use of convict labour (possibly from the Don Jail) to help clear the site; Coleman called a section of it the “convict cut.” Quarrying for stone was still going on there, and the cliff finally stared out like some great stone face at its miners. The stone repaid Coleman’s close look by informing him, through its fossils, about just how old a site Toronto sat atop. Not everyone found such facts reassuring. Coleman had been born into one of those preacher’s families (in this case, Methodist) that proved a formidable nursery of talent. A scarcity of money, and an emphasis on learning and drive can turn an upbringing into a propellant to the top. 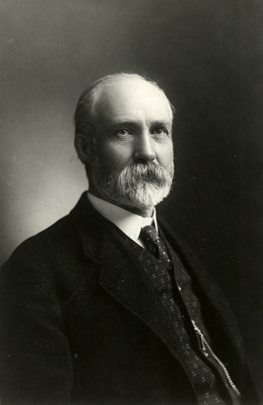 Spending the bulk of his career as a professor at the Methodist-founded Victoria College (now part of UofT), Coleman never quite abandoned the doctrines that had been part of his raising. Small wonder that in a conservative culture like colonial Canada’s, a figure like Coleman shared the common conviction among the learned and devout that geology’s revelations supplemented rather than supplanted those of scripture, the rocks serving as testimonies to the awe-inspiring agelessness of God’s handiwork. Science could be used—carefully—to confirm God’s handiwork rather than smother it. Geological map of the Sudbury Nickel Region to accompany a monograph by A.P. Coleman. Map dated 1912. Used courtesy of Victoria University Library (Toronto). The work of the geologists however, served as a necessary adjunct to capitalism’s economic development of the country. Analyzing the fossils trapped in the rock and the strata of the rocks themselves revealed much about the extent of geological time. 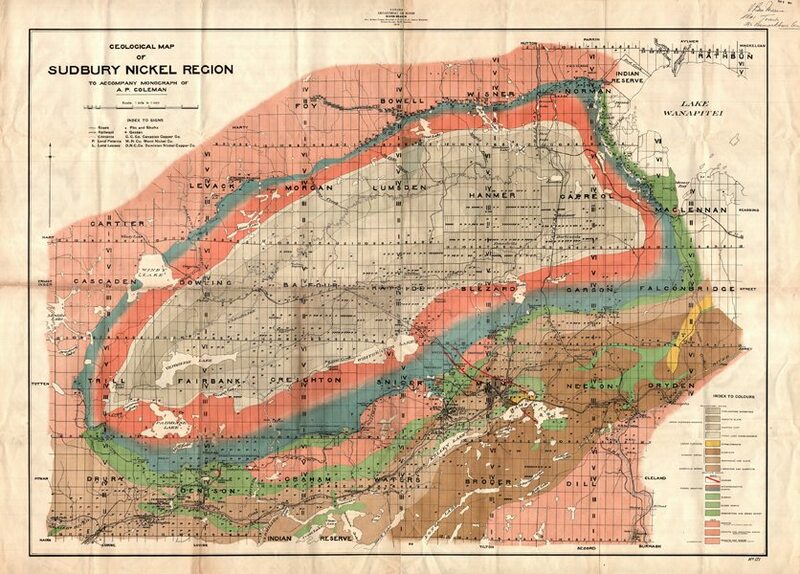 The traces of minerals and their recurrence also gave a geologists’ work an immediate and practical result, which is evident in work such as a map of the Nickel Belt that Coleman produced. Coleman wrote of the arduous nature of the geological mapping of the region, emphasizing the trials of his predecessors as they moved through a region “rugged and forest covered” and lacking “established canoe routes.” His was no easy stroll either. But he was involved in an enterprise that triumphed through accretion, even as piled-up fossils slowly coalesced into a readable record. Such a map as Coleman’s (and he drew many such, across Canada and elsewhere as he took his geology students along on summer expeditions) was more than a guide to the origins of the Sudbury Big Nickel that you can spy from the Trans-Canada. It helped provide the kickoff for the exploitation of Northern Ontario’s mineral—as opposed to timber—resources. It also promoted the growth of Bay Street, which has done so much to reshape Ontario’s image and boost Toronto’s takeoff toward its present position in the financial and commercial life of the country. In addition to his scientific achievement, Coleman was an excellent amateur painter and water-colourist. He could probably have scratched a living from his art, but it was a gathering of painters that we now call The Group of Seven who cemented the imaginative picturing of the New Ontario whose resources Coleman had played a decisive role in mapping. Sponsored and aided by various members of Toronto’s plutocracy, the Group of Seven fixed the imagery of a wild, untamed spiritualized landscape that was in fact having a grid of exploitation and development imposed upon it. Tom Thomson’s sketchbooks after all, contain images from a mechanized logging industry alongside his evocations of an “unspoiled” forest. If that characteristic Canadian blend of romantic nature with technological mastery of it strikes you as moronic or oxymoronic, then you haven’t taken a freeway to a pristine cottage. Coleman climbed as many rocks as he read. An accomplished mountaineer, he and his brother pioneered Alpine climbing in this country and he was among the first to climb Castle mountain in the Rockies. He tried no fewer than three times to make it all the way up British Columbia’s Mount Robson at an advanced age. He could paddle a canoe virtually anywhere one could go. According to a family story, he once slid down a South American mountain using as a sled a tray that he had brought along with him on the climb. He was in his 80s at the time. In honour of the geologist, a prehistoric body of water covering this region before Lake Ontario came to be was named Lake Coleman after his death. Toronto could use a main thoroughfare named after Coleman along the Don Valley, maybe on an overpass of the DVP, somewhere where our sense of the present could pay its debt to someone who illuminated our very distant past. In addition to the works cited in the text here and found in the Toronto Public Library system, Victoria College’s Pratt Library website assembles a cornucopia of imagery and information on Coleman and his remarkable life. Historicist looks back at the events, places, and characters that have shaped Toronto into the city we know today.